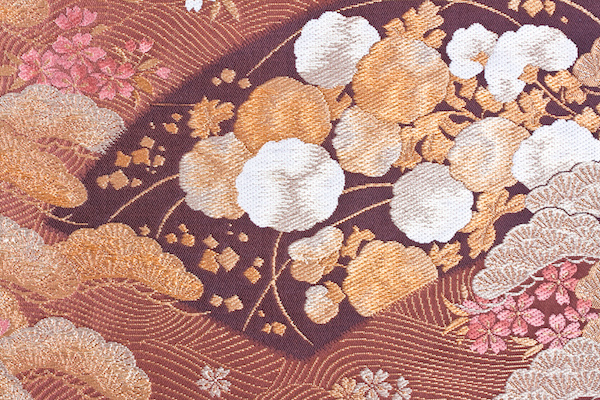 Among the kimono patters, there is the so-called “shikunshi”, which represents happiness and auspiciousness. This pattern consists of four types of greenery: orchids, bamboo, chrysanthemum, and plums. They were especially treasured in China, where it was said that their refined beauty was akin to that of a wise man with wonderful personality (kunshi) and so the combination came to be known as shikunshi, which means “four wise men”. What’s more, orchids represent spring, bamboo represents summer, chrysanthemum – fall, and plums are the symbol of winter. This pattern isn’t used only in the world of kimonos – there are often drawn together as a set, and the combination is often used as a fundamental topic for practice in ink painting. Plums, orchids, bamboo and chrysanthemum often appear in kimono patterns independently, and the general rule is that you should wear them during the season the given pattern represents. However, when all of them are included in a pattern, they can be worn all year long. There are also other patterns that combine motives from different seasons, like chrysanthemum and cherry blossoms, or butterflies and red leaves, to make it possible to wear them all year long.